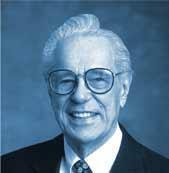 Kenneth S. Kantzer’s (1917-2002) career spanned the course of the resurgence of North American evangelicalism and was one of the factors that spurred it on. Dr. Kantzer served as professor of biblical and systematic theology at Wheaton College for seventeen years, as Dean of Trinity Evangelical Divinity School for fifteen more, as president of the Evangelical Theological Society, and as editor-in-chief of Christianity Today. Dr. Kantzer’s most important legacy was not a monetary bequest but a divinity school: Trinity Evangelical Divinity School, which he helped grow from a small denominational seminary into a major evangelical Christian graduate school of national and international reputation. It was his vision to combine centrist evangelical theological convictions with a commitment to academic excellence. His concern was to help evangelicals major on the majors rather than the minors. In this sense, he was the epitome of the “catholic evangelical.” (“The role of church tradition,” he once wrote, “is like that of an elder brother in the faith.”) He was a model of graciousness who would criticize only after listening charitably. (“Differences are not necessarily contradictions.”) He was one of the first evangelicals, for example, to go to Basel and learn from Karl Barth. He completed his PhD at Harvard University where he wrote a dissertation focused on the knowledge of God in the theology of John Calvin. It is therefore fitting that the lectures that bear his name be located at the institution into which he poured not only the best years of his life, but also his passion, energy, and wisdom.